I‘ve had the pleasure of learning so much about how to strategically align B2B Sales and Marketing this year through too many different interactions to count. 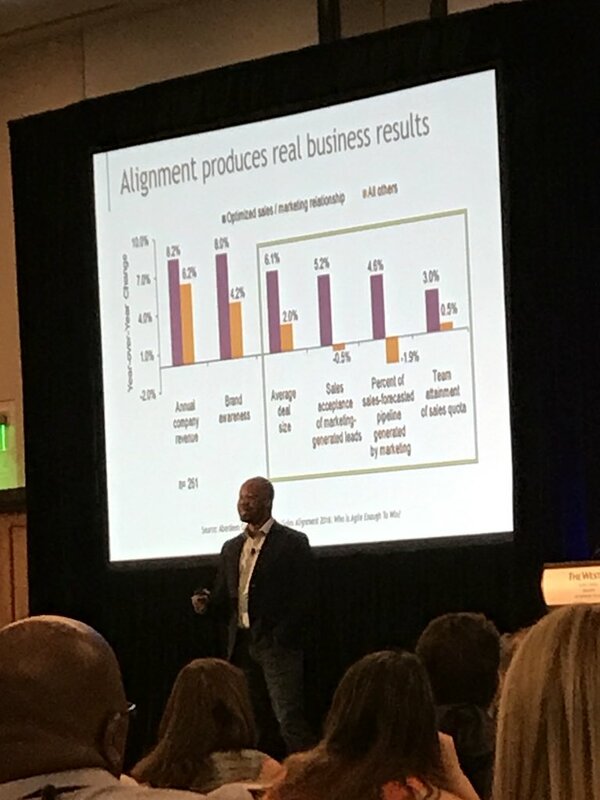 Whether it be through conversations with guests on TheAlignmentPodcast.com, talking to attendees after a keynote address, attending a conference, or reading great content published by others that have an interest in the topic, one thing stood out every time - alignment is no longer an option for B2B leaders. With that in mind, I’d like to share some of the top resources i think Sales and Marketing leaders show be aware of it they are looking to transform their teams into a high-performing Revenue Engine where Sales and Marketing are aligned to meet the needs of the modern buyer. A great book for Sales and Marketing leaders to be able to understand why alignment is so important and how to start the conversation not only together but with their senior leaders to gain support. A fast growing podcast for B2B leaders that fuses conversations with experts in sales, marketing, leadership, psychology, data science and more to create insights toward a more holistic and strategic approach to aligning Sales and Marketing. 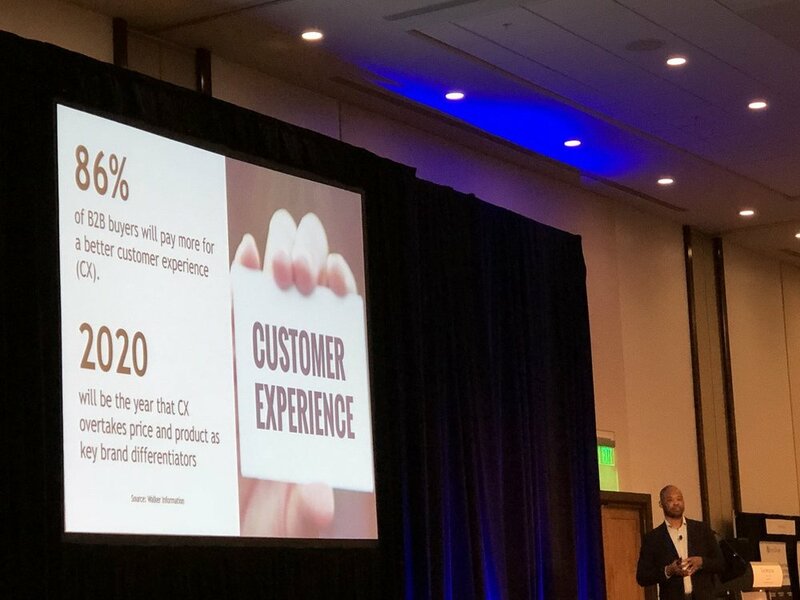 Study that demonstrates the rapidly changing demands of the modern buyer and how customer experience (CX) will be more important than ever in the near future to stay competitive. Online conference sharing proven strategies from top companies and thought-leaders on how Sales and Marketing can leverage AI to dramatically improve their results. Resource that can help marketing leaders better calculate and quantify the ROI of the marketing team’s efforts and demonstrate the value that the team brings to the sales organization. Study that highlights some practical benefits that the marketing team can offer Sales to help them gain new customers. Also, great content for sales leaders to better understand what they should be asking for from their marketing counterpart to help their sellers succeed. Article that helps sales and marketing leaders think differently about how they can work together to get in front of the buyer earlier in the process and help them shape a vision for what business solution(s) they need. Article and research on the benefits of Sales and Marketing aligning on content and its affect on overall strategic alignment between the two teams. Article on the importance of figuring out what a “good lead” looks like by creating an Ideal Customer Profile (ICP) by focusing on “fit” data which should include input from both Sales and Marketing. I hope these resources are helpful as you start planning out your journey to a more aligned sales and marketing team. Let's schedule time to talk! Excited to help B2B leaders get better at connecting with the modern buyer in a meaningful way and driving revenue growth for the organization. I had the pleasure of attending Showpad’s first ever US conference - TRANSFORM18. The theme was “Reimagining Sales Enablement”. 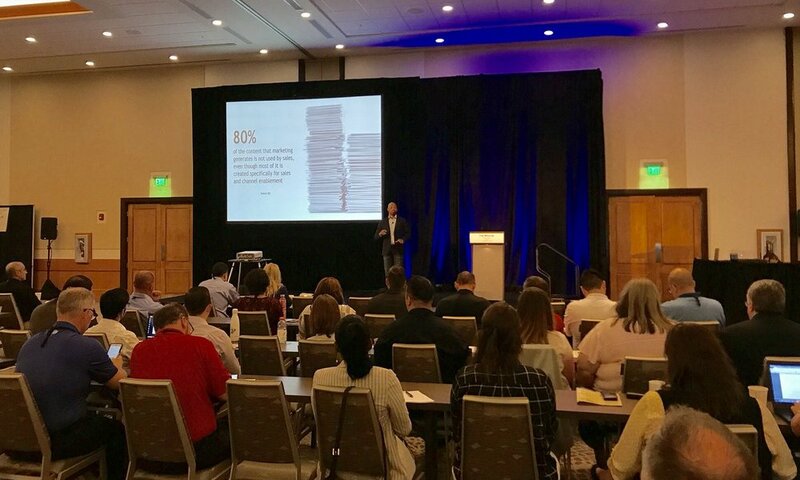 As a keynote speaker and business coach focused on strategically aligning Sales and Marketing, I attended because I wanted to see what the future of Sales Enablement looks like. I wanted to learn from industry experts and sales enablement practitioners alike to be able to share this knowledge with sales and marketing leaders that may/may not be fortunate enough to have a sales enablement role within their organization. The roster of speakers included knowledgeable folks like: Mary Shea, Todd Caponi, Roderick Jefferson, Tim Riesterer, and many more. 62% of B2B buyers say they can now develop selection criteria or finalize a vendor list - based solely on digital content. This means that we must ensure we are telling our company story via several different channels including third-party sites. You need different messaging when you are trying to “get” customers than when you are trying to “keep” them. Marketing can be a significant help to salespeople and account managers when connecting with customers in these two very different situations. We are not thinking machines that feel. We are feeling machines that think. 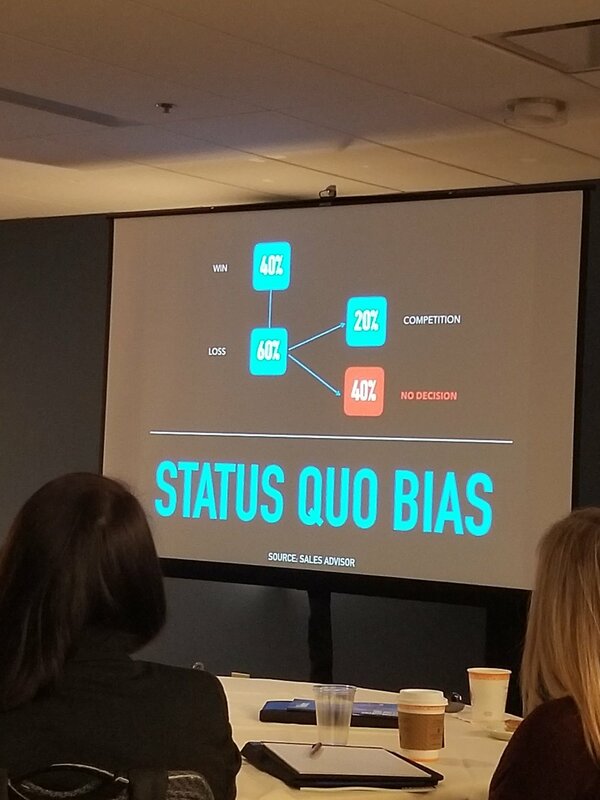 This means that most buyers make initial buying decisions based on emotion then justify it with logic - even in B2B. Hope some of the above learnings are valuable as you explore Sales Enablement and strategically aligning Sales and Marketing to drive growth. See you next year at Transform19! You’ve got plenty of leads—maybe too many, in fact. You’ve got plenty of potential sales calls and appointments. But when it comes to looking at the numbers—to comparing your conversions against the number of conversions you think you should have—then it becomes a different story. Welcome to the sales funnel conundrum, when the potential doesn’t match the reality and you start to question what’s going on. Well, in answer to that: There could be a lot of things going on, and it could be that some of them relate to problems in your sales funnel. The sales funnel is more often than not the place to start, and that’s because it’s a great way to pick apart your process and to find out what you’re doing and where customers are getting stuck. It has definable points, including top, middle, and bottom. As I've stated before, to have a robust sales and marketing alignment strategy you must address three key pillars - DATA, PROCESS, and COMMUNICATION. The graphic below will help you understand what’s happening and how to do a deep dive into your sales process. There's an old saying in geometry circles: every square is a rectangle, but not every rectangle is a square. It's true; all squares have the basic elements of a rectangle: four sides, four right angles. To be a square, though, all four sides must be of equal length; a rectangle only cares about equal length on its parallel sides. What does this have to do with sales and marketing? All sales is marketing, but not all marketing is sales. When the two sides realize this point, it changes the fundamental nature of how sales and marketing work in a business. In a B2B world, marketing effectively lays the groundwork for sales. It generates new leads into the system and works to establish the best conditions for sales to engage. Sales, meanwhile, delivers the decisive step in the overall revenue generation process. Sales relates the company’s value proposition to the prospective buyers, handles objections, demonstrates the economic benefit and ultimately makes the final arrangements for the delivery of a product or service. The two functions are inextricably linked, and yet are separate and distinct. Marketing's failures are a direct handicap to sales, while sales' failures make marketing's efforts a poor allocation of time and resources. What is Sales’ Contribution? What is Marketing’s Contribution? Some sales seem to occur without the marketing team having made a single contribution. It can be said for instance that in general a deal that was sourced and closed by an account executive without any involvement of the marketing team, can be attributed to Sales. Conversely, certain deals are signed when the majority of the value was created by the marketing team. A highly qualified opportunity can require very little effort from sales to close. In this light, marketing contribution is the incremental revenue generated by marketing activities. It can be measured intuitively: what would total sales had been had there been no marketing activity at all? Sales contribution, is the exact opposite: what would sales have been had there been no sales activity? By recognizing these two sources of contribution, marketing and sales, business leaders can better understand the factors that make up a good utilization of marketing resources and the sales activities that lead to the highest revenue. Marketing should effectively tell the sales force where, how and when a lead needs to be worked on so it has the best chance of success. This includes determining lead/product fit but also the interest level and the revenue potential of those leads. Marketing is effectively the gauge by which sales effectiveness is measured; if the leads are all poor quality, there's a problem in lead generation, and the process needs to be revamped. If leads and opportunities are all of high quality and bookings are not growing, there’s a sales problem and the relevant processes, skills and activities need to be re-examined. So, How Can AI Help? With AI, sales leaders can have a 360-degree view of their entire revenue generation process and see the exact value created by lead generation, prospecting and sales activities. From a sales rep perspective, AI can also gauge the overall quality and contribution of the people involved; factors like work ethic, team mood, product knowledge and closing ability. ● What is the true value generated by marketing activities? ● What is the true value generated by the sales development team? ● What is the true value generated by the AE team? When you know this, you can better optimize your sales and marketing resources, budgets, activities and give credit to the right team for the right reason. Then, you can drill down on the individual level and understand why some perform better than others. We miss all of the shots we never take, after all, and having a handle on activity levels becomes an excellent gauge into determining if we're really getting the most out of every minute in play. So while the sales department does have the ultimate outcome of the sales contribution in its hands, it can't get very far without the marketing contribution. If sales departments aren't presenting the value proposition correctly or handling objections to the lead's satisfaction, then it really doesn't matter how good a job marketing did finding leads; the sales department couldn't make the final appeal. Meanwhile, if the marketing contribution isn't up to par, the sales contribution is immediately hampered, spending its time, effort and resources pursuing people for whom no amount of sales efforts will convince the lead there's any value to the product or service offering. It's like trying to sell bowling balls at a fisherman's convention; sure, some of them may bowl, but why aren't you selling fishing gear to people who obviously want fishing gear? Even with the best numbers, calculations about the fit and interest of leads and opportunities are not enough. Calculations about lead potential have uncertainty built right into the name: potential. Yet as is often the case, management with facts in hand tend to produce better results than management without facts. Uncertainty cannot be removed from the system, but it can be addressed, managed and improved incrementally. AI makes it possible to measure the incremental value generated by every link in the sales and marketing chain. By applying machine learning and natural language processing (NLP), businesses can gather numbers that reflect reality, enabling you to make the right adjustments and get your sales and marketing teams humming in tune. Therefore, whether you’re in sales or in marketing, base your discussions over actual contribution in numbers, not on gut feelings. Learn what's working in the sales and marketing process and what isn't, so that the most effective changes can be made on all sides. Rob Käll is an accomplished entrepreneur with 3 Successful MM exits in 10 Years. 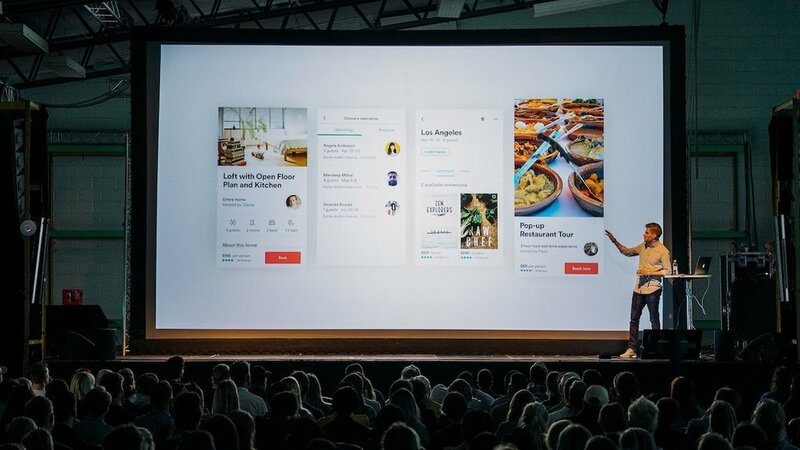 His latest startup, Cien, gives sales leaders an immediate edge by using the power of AI to increase the productivity of their teams. Automatically detecting problems, predicting outcomes and recommending the shortest path to success. 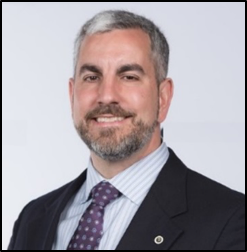 A versatile leader that has served as Startup CEO, Corporate Exec and Technical Founder, Rob advocates a scientific approach to sales and marketing alignment. Connect with Rob on Linkedin and Twitter. Every time I attend a new conference or get the privilege of speaking to a new group of people, I like to take some time to reflect on what I learned during that interaction. Embarking on this journey to better understand how to strategically align Sales and Marketing has put me in a unique position where I enjoy getting to learn from professionals and cross pollenate those insights, ideas and concepts to help us all increase our business acumen. 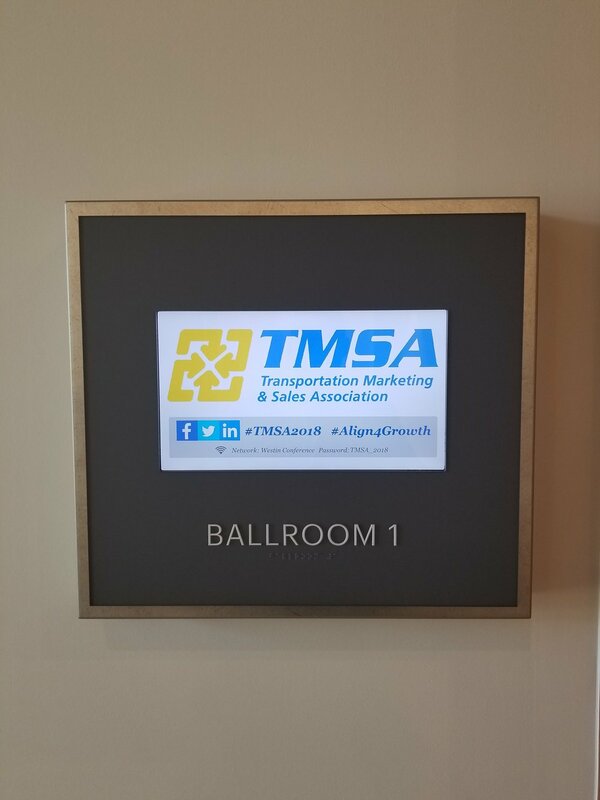 One of those such chances was being selected by Brian Everett and the board of TMSA (Transportation Marketing and Sales Association) to be the opening keynote of their annual conference. I opened my session by helping everyone focus on what powerful partnerships have been able to accomplish in the past in order to set the stage as we all interacted with each other during the conference. My intent was to help us think about building partnerships across the aisle to help us drive better business outcomes. 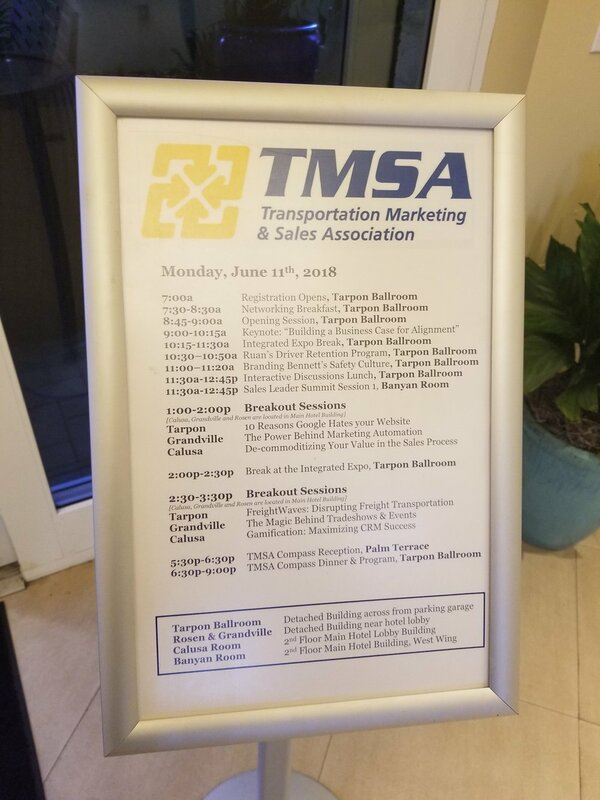 Beyond sharing my perspective on Sales and Marketing Alignment, I learned a ton about the trucking, logistics, and supply chain industry - what an interesting industry that affects all of our lives. If if weren't for them, Amazon Prime 2-day shipping wouldn't work. In order to get the attention of the CEO we must speak his/her language which means connecting our efforts to the growth of the organization. Influencer marketing can be a useful tool to accomplish your growth goals. Truckers themselves can become a significant partner in helping solve the lack of drivers on the road. Due to regulations, companies must sometimes establish working relationships with direct competitors in order to ensure customers are serviced adequately. Enjoy some of the pictures that I captured of my keynote presentation and the conference! 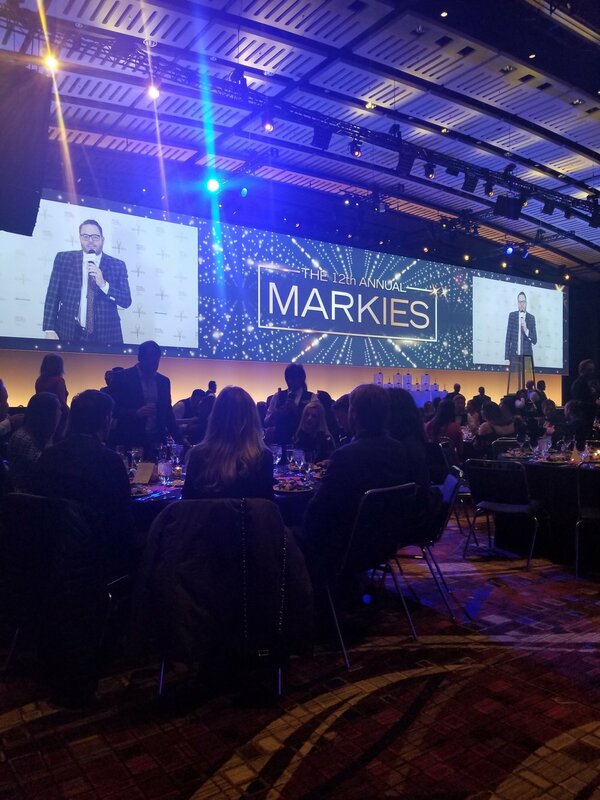 I had the pleasure of being in the room with sales leaders from Chicago's top tech companies this week at the first-ever Sales Assembly Summit. It was an opportunity not only to learn what it takes to drive growth in an organization, but I wanted to hear the perspective of sales leaders on the topic of aligning with their marketing counterparts. I was pleased to see that the alignment conversation was one of the first sessions of the day. We have to be able to translate marketing messaging to sales messaging to be effective at closing more customers. Sales leaders must understand the sales process and what is going on throughout the entire pipeline. They must also understand at a high level what Marketing is doing to help support pipeline revenue. Looking forward to next year's event. Thanks to Jeff Rosset and Matt Green for cultivating a great event and community here in Chicago! Let’s face it, there often can be a disconnect between a business’s marketing and sales departments. According to at least one LeanData survey, more than 50 percent of sales and marketing professionals aren’t happy with communication and support from the other department. Any business that wants to grow, however, has to get these two teams working together. Why? Simply put, salespeople have knowledge that can help marketers, and marketers have power and influence that can help sales. When you get these two teams aligned, sales can guide marketing and marketing can prepare leads for sales. Your business becomes more efficient. How do marketing and sales work together to increase business leads? Here’s a look. Because the sales team has direct access to new prospects, it has the firsthand knowledge of what questions commonly arise. By giving that knowledge to the marketing team, it empowers marketers to craft messages that better target their audience. What to ask. Salespeople know what prospects are asking, so savvy marketing professionals tap into that knowledge. Marketers can ask salespeople directly, listen to sales calls, scan sales communications with clients, etc., to find out what prospects want to know. Are potential customers often wondering how exactly a product works, for example, or about what makes the company different? Do prospects want to see demonstrations of how to use a certain tool or examples of a device in action? What to do. If marketing can answer questions for prospects before the sales team has to, it expedites the buying process and makes sales easier. That’s why common customer questions are valuable market research — information that fuels web copy, blogs, email newsletters, videos, etc. When the marketing team understands where its audience is coming from, it becomes better equipped to reach that audience. The sales team also can be invaluable for providing the marketing team with common hang-ups that stall sales. When marketers understand what hurdles need to be overcome for a purchase, it has a great place to start with marketing materials. What to ask. Marketers need to ask the sales staff about what prospects cite as reasons to delay or decide against a product. What issues are preventing them from moving forward with purchases? What holds them back? When marketing understands what clogs the sales cycle, it has fodder for marketing messaging — ideas for building relevant, compelling material that will reach the target audience. What to do. Some of the most effective marketing channels will speak directly to prospects’ hurdles. If committing to a purchase is a deterrent, marketing might feature a free trial. If credibility is a problem, marketing could focus on building trust with testimonials, endorsements, before/after pictures of service, or a money-back guarantee. Businesses that want to stay competitive and reach growth goals need to take the marketing-sales relationship seriously. By getting these two departments working together, everybody benefits. This guest blog was written by Shanna Mallon. She is a contributing writer for Straight North, a leading Internet marketing agency in Chicago providing SEO, web development and other online marketing services. A freelance writer, Shanna has been creating online content professionally since 2007. I had the great pleasure of recently attending the AA-ISP AI Sales Summit. It was the first of it's kind and it definitely delivered a really insightful experience. I was interested in attending to better understand how we can leverage AI to align sales and marketing to make more efficient decisions based on data. AI can write content that is nearly impossible to detect that it's not human. How does this effect creating relevant, on-demand content for customers? Customer don't want more information - they want insights about their business. Both Sales and Marketing must focus on Customer Experience (CX) to be successful in the future. We must remove the friction from doing business with us or customers will go with another provider. If we want to empower salespeople with new technology, we must start to speak their language and help them understand how it will help them sell more effectively. They want to win, hit quota, and make money! AI can help with lead scoring which has implications to helping both Sales and Marketing sift through leads and take action on the ones with the most potential to lead to new business. It was such a pleasure being invited to attend Oracle's Modern CX conference this past week as a marketing influencer. I was really interested in understanding how the principles of customer service (CX) could be applied to helping B2B organizations align Sales and Marketing. The I also learned a ton from interviewing CX thought-leader - Shep Hyken. Be sure to check out our Facebook Live Interview where we discuss the conference, how CX has changed over the years, and his upcoming new book. Marketing is active throughout the entire buyer's journey and can do significant damage if they don't truly understand the needs of the customer. What do I need to know about them and their organization to have impact? What products or solutions have they shown interest in? What content should I use to support this conversation? The MarTech 5000 is real and only growing! As leaders, I hope we continue to connect with and learn from those that are outside of our direct line of sight as many times they have perspectives that spark a new way of thinking. Thank you Oracle for such an outstanding conference and opportunity to connect with passionate CX professionals. As the CMO, I think its important to have an idea of the areas that need to be addressed in order to achieve better alignment between our teams before having a sit down with my VP of Sales (let's call her Janice). I want to ensure that we can establish a clear roadmap, metrics and milestones to help us stay focused and in sync as we begin transforming the company. Doing this work will also help us secure the support of the CEO (why not call him Mark) which is vital to the success of any alignment effort. The key areas that need to be addressed in any alignment effort are: Communication, Process and Data. These are the top reasons for misalignment according to a recent study published by Inside View. Using these areas of friction as a framework, we can start to organize our thoughts and efforts around what we need to be focusing on while hopefully causing minimal distraction for our teams. So now that I have a general idea of the areas that Janice and I need to address, where do we actually get started? In my opinion, a broken process is probably the root cause of many of our problems. Then, let's start there! One of the most impactful opportunities in an alignment effort is to focus on creating a robust prospect-to-customer process. The most effective way to do that is to ensure that both teams focus on the pipeline revenue. This laser focus on revenue ensures that everyone knows exactly where we are in hitting our revenue target and also know how their work directly impacts us achieving that goal. Marketing should be able to say "Yes! We are 98% to goal." just as the sales team already does (at least that's want Janice tells me). Customer Personas - who are we targeting and what business problem(s) are they struggling with? Positioning - What is the unique value that we offer that no one else can and how do we communicate that clearly and consistently? Messaging - How do we speak the language of our customers so that it is easier to connect with them and start a conversation? Market Intelligence - How can we empower our sales people to have higher-value conversations with prospects that position them as a strategic advisor rather than just a sales rep? Content - How do we thoughtfully produce content that addresses the needs of the customer and key stakeholders at each stage of the buyer's journey? Janice and I are both data-driven folks so that's a great start. Data is in the DNA of the company. However, data is not enough to win. We need insights to help us make informed and intelligent business decisions. Before we get to that though we need to first ensure we are even looking at the same numbers. With all the new additions to our Revenue Stack (sales + marketing tech) we need to do an audit to make sure we are speaking the same data language. This tech audit also allows us to see where gaps and redundancies exists. And there is one metric that wins above all. We start every meeting together by addressing it. You probably guessed it.....Revenue! When sharing data we would continue to ask each other "So, what does that mean for the business?" to ensure we are getting at business insights and not just doing a data review to check a box. These insights are the fuel for our growth. In order for us to win together, Janice and I are going to have to learn how to collaborate - for real. One thing that I have learned is transforming into a truly collaborative relationship takes time and has many stages. We can not just say we are going to collaborate. We must take into consideration how we as leaders can create an environment that supports this effort and provides the necessary resources to do so. 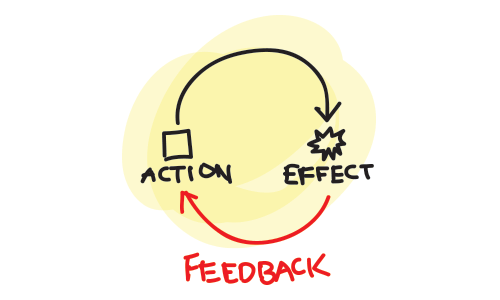 If we want Sales to tell Marketing what is/is not working but don't encourage honest feedback or give them an organized way to give it, then we really aren't serious about creating this communication link between our teams. 1 The original Collaboration Continuum, which included Networking, Coordinating, Cooperating, and Collaborating, comes from Arthur T. Himmelman, Collaboration for a Change: Definitions, Decision‐making Models, Roles, and Collaboration Process Guide. January 2002, Himmelman Consulting, Minneapolis, MN. And if there is no other area I get right around communication, I want to ensure I do whatever I can to get feedback from the sales team. What I've realized over my time as CMO is that sales is my fastest and cheapest market research. Speed to market is the vital differentiator many times in B2B. Having this close relationship with my sales colleagues is extremely important to me as a marketing leader. A side effect of this effort is that it also helps gain credibility and trust with Sales; something that many marketing teams don't have. Janice and I also discuss how often we would meet to check in on our progress on alignment. As folks who hate superfluous meetings this can be tricky. We both realized though that you have to inspect what you expect and the only way to do that is to have joint sales and marketing meetings on a regular basis. Meeting frequency depends on the size and maturity of the company, however for a new initiative like this I think monthly leadership and quarterly team meetings sound reasonable. The leadership meeting would focus on the data and figuring out if our alignment efforts are effective and positively impacting revenue. The joint team meetings would focus on major cross-functional metrics/insights, our attainment of our revenue goal thus far, and any wins achieved by cross functional teamwork to continue to promote cohesiveness between the teams. I would also use these meetings as a way to identify opportunities for the sales and marketing team members to work on special projects or find ways that they could actively learn from each other. After all that work Janice and I go to Mark as the "Revenue Engine" team and let him know how we plan to transform the organization. And because we jointly represent how the company makes money he gladly supports our efforts 100%. High five, Janice! What Janice, Mark and I realized doing this work together is that we have to create more empathy between our teams so they understand and appreciate each other more. We realized that even we struggled to always understand what each was dealing with on a daily basis. How then, were our teams supposed to get it? We are all sure that this empathy is going to be the glue that brings our teams together and charge them up to achieve better results as a unified force. I'm excited to "create togetherness" between our teams and drive revenue! With all the new B2B tech coming at companies today, it's hard not to fall victim to the "shiny new objective" syndrome. It's also sometimes even harder to push back on demands to "Fix it Now!" by not just throwing tech at it. The problem you run into is that implementing new tech is not addressing the real problem - people. I've said many times, alignment is not a tech issue, it's a people issue. Thus, continuing to adopt new tech without addressing the people part of the problem is not a sustainable approach. With that said, let's talk about what types of tech are necessary to have a Revenue Stack (Sales + Marketing tech) that helps you sell more effectively by empowering the sales and marketing teams. I think its more important for us to focus on the categories of tools we need before diving into trying to determine the best vendor to use. Taking this approach allows the company to clearly understand where technology gaps exists. I think doing this type of tech audit before making purchasing decisions also will help to eliminate unforeseen duplication in technology which many times creates more confusion; making the selling process even more cumbersome. Below is a great depiction of the current revenue stack landscape from Nancy Nardin. As you can see the options seems limitless and they are growing. This is what is causing the "shiny new object" syndrome many B2B companies are suffering from. What makes a good Revenue Stack? I've had many conversations with experts in the field of sales and marketing tech and below are the categories that I've seen are necessary to have an effective Revenue Stack. My intent with this list to help sales and marketing leaders be thoughtful when proposing new technology to "fix" the alignment issue. Data - Clean data is the basis of any stack as without it we make poor decisions on outdated and incorrect information. We must also take into account that on average 6.8 decision makers are involved in the decision process. Add the fact, that several members of that team my change roles or responsibilities within the sales cycle making it more difficult to create consensus. The more proactive the team can be at getting ahead of those changes, the better. CRM - This system might be the most valuable tool that a company can use to conduct business if used properly. Customer relationships matter most and a CRM can help you keep track of those relationships as well as every touchpoint you have had with a customer. This helps paint a clear picture of what's going on and also reveals opportunities that you may have otherwise over looked. Marketing Automation - Beyond helping to save time and money, it's been proven to increase revenue and ROI. In addition, it allows the marketing team to focus more on an effective strategy rather than ensuring repetitive tasks are completed on time. Onboarding/Training - Bringing in new sales representatives can be expensive and the time it takes them to ramp up to full-productivity is a significant amount of lost revenue. It has also been shown that 87% of training content is forgotten within weeks. This demonstrates the need for ongoing, dynamic training. This can be achieved with tech-enabled on-boarding tools that not only allow sales reps to take advantage of on-demand training, but help them be able to reference back to things they make have forgotten to get them up and running faster and provide them with a tune-up when they need it - without the need for a formal training session and time out of the field. Account-based Marketing (ABM) - ABM has proven over time to provide significant ROI because it enables collaboration across the organization to meet the unique goals of the client. In the past, due to cost and complexity, ABM was left to large enterprises to focus on a few highly-valuable accounts. Now with new marketing tech and tools, organizations of all sizes can take advantage of this highly effective strategy to personalize outreach to targeted accounts. There is a ton of new sales and marketing tech available. And, there is more coming! However, we have to stop before introducing new tech just because it exists. The more cost-effective method that will lead to better long-term outcomes is to take a step back and look at where the gaps exist in what we currently have and then find tech that helps us fill in those gaps. In addition, leaders must be cognizant of how to communicate with the sales and marketing team the reason the new tech is being introduce and how it empowers them to achieve their goals more efficiently or effectively. I had the opportunity to speak with top B2B companies in Paris and Europe about the challenges facing B2B companies that don't embrace the need to align Sales and Marketing.